Defend the artistic integrity of Park Fiction: Save Golden Pudel Club! Mini_Pudel_Salon_Einweihung: Sonntag 15 – 20 Uhr, mit geheimer überraschender S-E-N-S-A-T-I-O-N! Verteidigt die künstlerische Integrität von Park Fiction: Rettet den Golden Pudel Club! We, the undersigned, support the struggle to defend the integrity of the art project Park Fiction and to keep the Golden Pudel Club as a part of the park and Gesamtkunstwerk Park Fiction. Park Fiction is Hamburgs most prominent example for Art in Public Space. The central idea of the project is the appropriation of the city through the many. The fabric from park and Pudel was developed with artistic means in the community, in a self-organised, independent and public process. Neighbours and artists enforced the park instead of the corporate building that was planned there originally. The arson at the Golden Pudel Club has ripped the heart out of the park. Without the Pudel, the park is like Versailles without the palace, or like the Mona Lisa without the smile. When the park project started in 1994, the Golden Pudel Club was already there – even back then threatened by demolition. 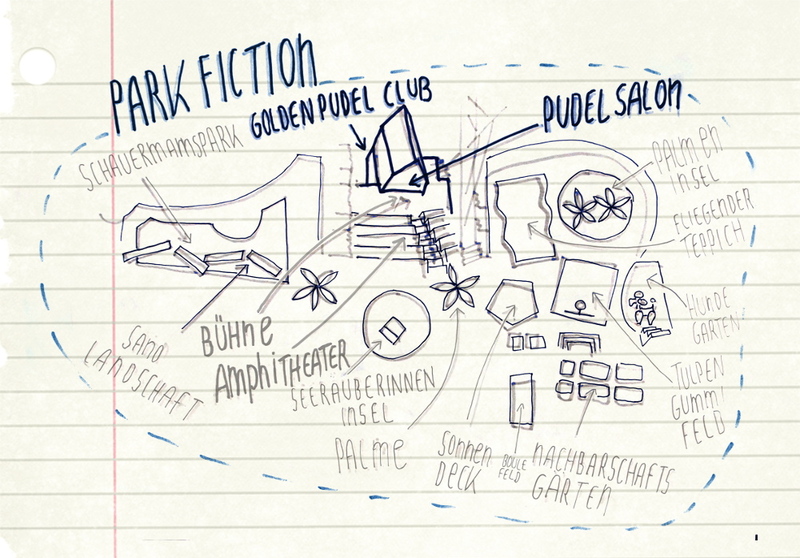 Since then the Pudel is an integral part of the park-concept. Beyond it’s undisputed position in the international music scene, the Club is the musical and subcultural centre of the park. The club is supposed to send impulses into the park and vice versa. It was the officially declared aim of the Park Fiction Initiative, not to create a „public norm-space“: The Pudel has the task to provocate artistically, to startle, to surprise. And to work as a ressource for the park. This is why the park has been conceptualised around the Pudelclub. A considerable sum of public money was used to design and build the connection between park and pudel by constructing an amphitheater. The Park Fiction Archive was installed in Pudelsalon, above the club, now half of it soaked from the water from the firefighters. But that is not the main problem. The tight interweaving of the house with the public space is a valuable, yet fragile connection. It is essential, which artistic attitude drives the people who run and own the club. Thus, in the course of planning the park, at the the turn of the millenium, the district Altona gave a long term contract of lease directly to the operators of Golden Pudel Club. The conditions of the contract were negotiated between 1997 and 2002 at the round table Antonipark, who accompanied the Park Fiction process as a decision and coordination committee: Administration, artists, neighbours, church, school, community centre, Park Fiction and Pudel were part of the process. Already back then, local politicians saw the place as something valuable. Thus the contract’s goal was the protection of the cultural use by Golden Pudel Club – for a long time and at cheap conditions. The use of the top-floor as a Café was tied to the obligation of Pudel, to run public toilets for the park. In 2007, by the time Hamburg was governed by the conservative party, the fiscal authority sold a lot of city-owned real estate. Amongst them the Golden Poodle Club – withpout taking into account the specific siting in the park. The purchasers, two of the shareholders of Golden Pudel Club, did not arrange the deal in accordance with the other players – neither Park Fiction, nor the Poodle-Team, not even the other partners were informed. Hopes, that the new private model of ownership would secure the Poodle permanently in the park, were soon to be disappointed: One of the new part-owners, a Wolf Richter, soon fell out with all of the Golden Poodle Scene as well as Park Fiction, taking action against the club since then. 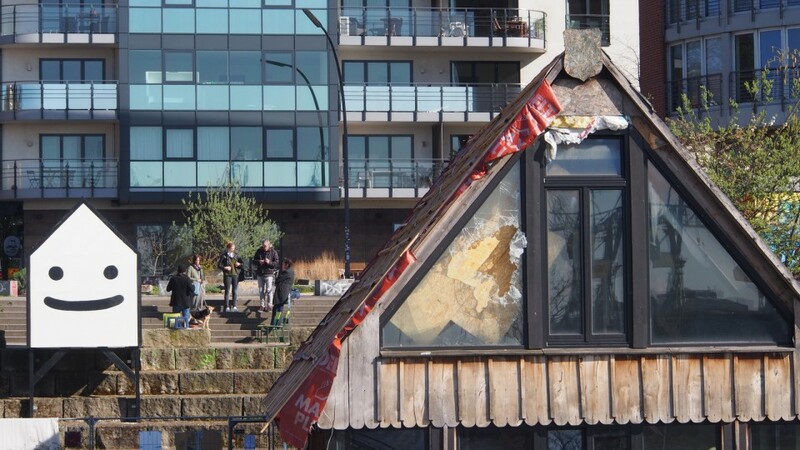 After the arson attack, the club now faces the final axe: The reconstruction of the house is currently prevented by part-owner Wolf Richter. He also inforced the pending auction by court order, allegedly with the intention to buy it himself. And he tried, after the arson, to terminate the long time lease contract with the Golden Pudel Club. Park Fiction paradigmatically stands for an art, that intervenes into urban space. Since it’s exhibition on Documenta11 in 2002, it is a international model, that has to stay alive and intact as an ensemble wich must not be adulterated. The term collective desiring-production was introduced into urban planning by Park Fiction. The connection of art with musical subculture has given a vibe to the collective process, which is usually missing in normal political or planning procedures. In a playful manner the project has shown, how bottom up urban planning can work as a platform of exchange. This approach increasingly spreads, gaining importance. The most interesting projects work with art, to enhance the capabilty of local knowledge to change and to design. The artistic idea of the oeuvre plays a central role in these processes of appropriation – and with Park Fiction Hamburg already in the 90ies placed a milestone, which is now endangered in it’s core. – re-defining the upper floors in a collective process together with Pudel and Park Fiction for arts and the community. We support the idea that Golden Pudel Club developed together with the other associate, Rocko Schamoni: to take over the real estate into a nponprofit foundation. Apply all means necessary, to realize this solution. Pilar Villela Mascaró, Kurator, Mexico D.F.